Star Trek Secret Voyage hasn't added a story. Secret Voyage is a webseries production chronicling "The Final Classic Adventure of the 23rd Century". Join a new crew assembled by Starfleet for a covert mission celebrating 45 years of STAR TREK! 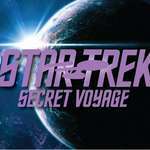 Star Trek Secret Voyage hasn't posted any updates yet. Star Trek Secret Voyage is managing the funds for this campaign.